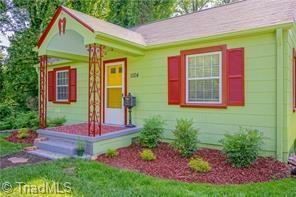 1104 Martin Street, Winston Salem, NC.| MLS# 914116 | North Carolina Farm and Vineyard Specialist Patria Properties Inc. It's hard to find affordable and adorable in Ardmore anymore. Love and care went into this wonderful two bedroom cottage with a large yard, full basement, and plenty of attic storage. Hardwood floors, new windows, a new heat pump, as well as a roof replacement in 2016. The location is ideal, the price is right and there is nothing to do but move in and enjoy your new home.